Yves Behar, the designer of JawBone’s JamBox speaker, has obviously heard that I’m looking for a JamBox bike mount. Only instead of just designing a mount, he’s gone and built a whole bike to hold the thing. That’s not strictly true, of course. While the Local, as it is called, does indeed hold a JamBox, it is designed to do a whole lot more. The Local is “the bike version of the practical pick-up truck.” To this end it does everything other cargo trikes can do, and more. 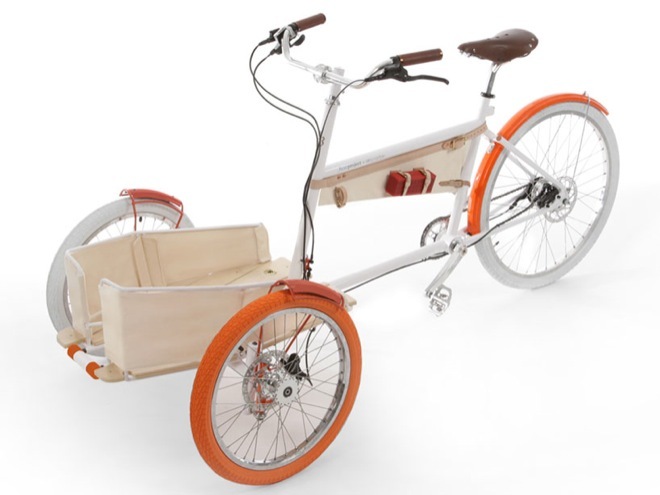 The Local will carry luggage and kids on its low front platform, and with a strap it will even carry a surfboard. Lights are built into the frame, there’s a tether to stop anyone snatching your bag off the front shelf and the bike features the first integrated lock that looks like it would work. The D part of a d-lock is integrated into the frame at the front, and a bar locks across its ends. Remove the cylinder, drive the bike so its front swallows a pole and re-lock. You’re done. Finally, a Shimano Alfine 11 hub and disk brakes front and rear will start and stop you easily. The idea is that you can use this bike to do anything a car could do in your neighborhood. I like it a lot, and especially the light, bright colors that make it less like the serious cargo-carriers my local fruit shop uses to deliver its goods. Behar makes no mention of price or availability, but if any concept deserves to make it into the real world then this is it.